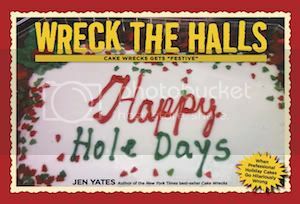 For many wreckerators, no cake is more of a tongue-out, slightly-hunched-and-grunting impossibility than an animal cake. It's not for lack of trying, mind you. ("Squished Shih Tzu" is actually a bakery standard these days.) For all their trying and failing, though, there are times when the results are actually kind of cute. Kind of. In a mutant sort of way. Now, the poodle is a ridiculous looking dog. You can tell by how ridiculous it looks. You would almost think it would be impossible to make it look any more ridiculous, but if so, the yolk's on you! Haha! Or maybe on this guy. ...is a chinchilla. I would very much like to snuggle him. But I would also like to snuggle it. And maybe nom an ear. From the genus Crocodillius Seinfeldus. But at least this case also has some nice roses. "Meh. Hedgehog, hedge pig... same difference." Thanks to Tim A., Stephanie D., Shirley L., Nathan M., JoeyJoJo and Monique R., who are all toy-gers. Toit toy-gers. Rawr. LOVE the manicure on Mr. Complicated! Hedgie hedgie hedgie hedgie what the HELL is THAT thing supposed to be??? I like the chocolate ganache/almond pufferfish! He's kinda cute and happy that you're gonna EAT 'IM! I'm with Jenni. I think the Blowfish cake is cute. But seriously a Hedgehog cake? Is there a pent up demand or something? Thank you for making my day special with a cutsey croc/gator, hedgepig, and blown-awayfish. You guys are AWESOME!!!!!!!!!!!! wv:beryle: These aminals are beryle recognizable, but hilarious! Remember Q*Bert from the 80s arcade game? That's who that orange pig cake reminds me of. 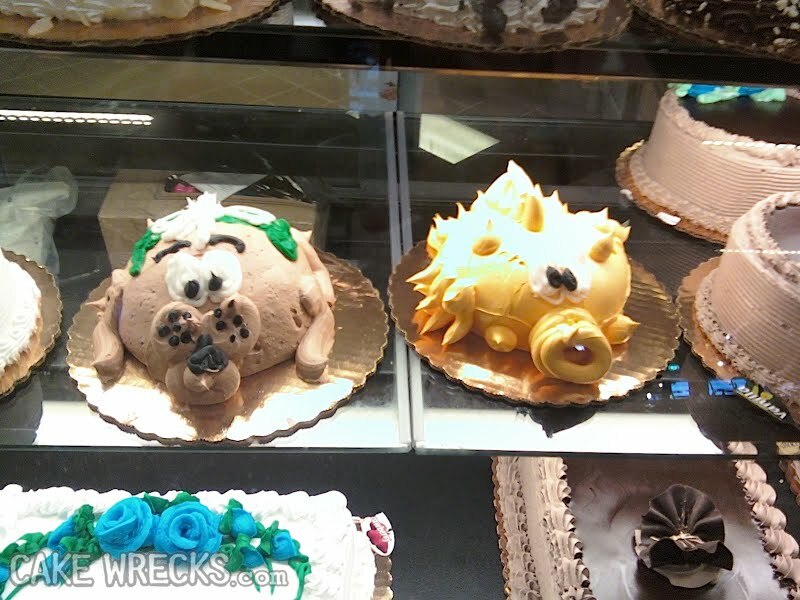 Those are some really wrecked cakes! But if a Croc wants me to think that he's cute and cuddly, well, I'm not going to argue too much with something that big! Yes, I have a question about the blowfish cake. ARE THOSE FRENCH FRIES!? That blowfish is hysterical. And spot on with Seinfeldus! Is it wrong that the blow fish one makes me think of Seth Rogen? "...and this is a blowfish on antidepressants." The sign on the chinchilla actually says "coney bunny (cookies and cream)" not that anyone would guess rabbit from looking at it! I can almost hear the animaniacal laughter coming from those cakes. They're laughing I tell you. They're laughing. Geez, the tongue on that poodle would make Gene Simmons jealous! I'd nom an ear too, but snuggle? No. Why does the dog have *green stuff* on it? Why are its whiskers above its nose? Why does the "pig" look more like a blow fish? Looks like he's blowing real hard too. Now there's a pig/hog...with...painted...nails...oh, and lipstick...that match the color of its eyes...ewww! LOL, my late grandma would have pronounced that "tagger". wv: bensubst: The wreckerators bensubst[ituting] these cakes for real animals. Wow, I'm really digging the salsa-red nails on that last wreck. "I may be a mutant animal, but I'm a fashionable mutant animal." 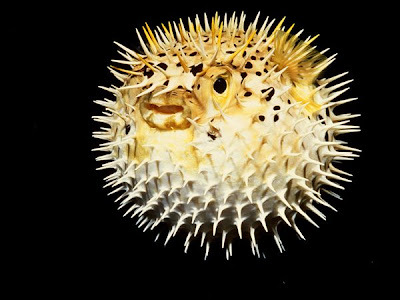 OK, I'm all on board with the cute blowfish comments, but WTH did they use for the spikes? I thought it was skewers, but they're not uniform enough... maybe slivered almonds? Where DO you find these photos?! Super funny, I want a bite of the creepy poodle head!! Almonds, people. The spikes on the pufferfish are almonds (and I'd bet it's supposed to be a porcupine cake). Jen and John, if you venture far enough from the cake side of the bakery you may encounter some French-bread alligators. Just sayin'. The ones I've seen have been much better looking than this cake. Lastly, do I detect a sly Goldmember reference? Points! Poodles are actually very smart, friendly, good-natured dogs. I didn't realize this until my grandmother got one, because I was fooled by those topiary things people do to them. 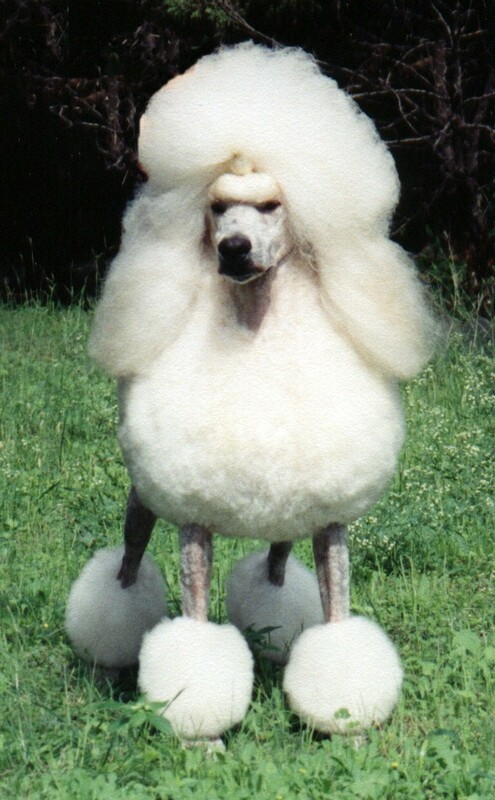 But remember, poodles do not choose their own hairstyles. I actually like the blowfish, even though it looks more like a porcupine. @Zanthia: I think they are almond slices. I like him. the poodle cake wreck kinda scares me. Hey Don't criticize the poodle. They're smart (mostly smarter than the other dog breed you posted and yes I know I've worked with both). That cut has a purpose! How can you tell what these are supposed to be? PS: I love, love, lurve the blowfish cake. It's the Awesome Smiley in black! Poodles are brilliant, awesome dogs. Love the hedgehogs painted nails...not that one has class! My questions is, Who orders a Blow Fish Cake to begin with? Soooo.... I really LIKE the blowfish cake. It makes me smile. We once had a pufferfish and he smiled all the time. He loved people and would come swimming over whenever anyone went past the fishtank. He would have loved that cake! As for the hedgehog cake, I guess it really looks like a hog hiding in the hedges. A real hedgehog is just too cute for it's name. He was the smartest dog we ever had and often complained about his breed being the brunt of so many jokes. I like the blowfish cake too. I wasn't going to comment but my word verification is 'scones', which as I sit here in jolly old England is quite funny. Fancy a cuppa anyone? Seriously, what is the purpose of of this cut? Please don't think I am being sarcastic, but I would like to know why poodles are trimmed in a way that makes them look so .....odd. I adore the chocolate and almond Happy Blowfish cake. Thanks for the sly Austin Powers reference too, it made my day! Glad I'm not the only one who saw french fries instead of slivered almonds on the happy blowfish! And the sign by him does say porcupine, but are we really going to trust the wreckerator to know the difference? The manicured one reminds me of the mini poodle my friend had; her mom would always have its nails painted at the groomer. It was weird on a real dog and even worse on a cake creature. awww, I think the blowfish is cute! When I saw the "pig," I said out loud, "Oh my gosh, that's supposed to be a PIG?!?" "Blow fish on antidepressants" - Thanks for the pick-me-up. I laughed out loud...my nurse (I'm in the hospital right now) gave me quite a funny look. Coney Bunny should be "Cony Bunny" as it is really a pika, a bunny cousin sometimes called a cony. Gotta forgive the Chinchilla mistake there, as that's a pretty close, based on looks. When I read the title of this post as "Animaniacs", I started singing the theme song. Then I read further down and was more than a little sad that it did not involve Yakko, Wakko, or Dot. 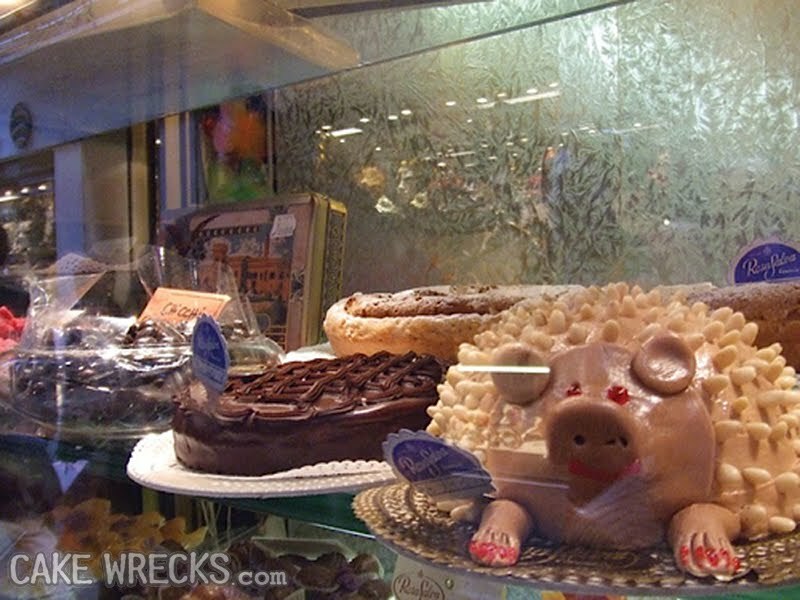 Actually the hedgehog cake would be pretty good if it didn't have that silly pig face on it. The Wreckenators caused me a lot of andst. Aww the last one is kinda cute! Eh, hedgeHOG or PORKupine, they both look swine to me. Sorry. Hungry. And there's a pork teriyaki takeout calling my name from down the street. I love the Happy Blowfish! I'll have whatever he's having... and maybe a little of him too. Bahahahaha genus Crocodillius Seinfeldus! Awesome! I love the blowfish! I think it's cute LOL. Absolutely bestial wrecks today -- thanks for making me laugh! That cut? Nothing. :-) Well, maybe winning in the show ring. But the original version of that haircut, shorter and allowed to curl, but still with the shaved areas had a purpose in hunting. Poodles are retrievers bred to go into the water. The haircut made them hydrodynamic, but with some fur to protect head, chest, joints, and sometimes kidneys from the cold. I like an even-all-over "puppy" cut on poodles, myself. And the ones I have known have been great, friendly, smart, fun dogs. And I hope this doesn't turn into poodlecutcot! Wreckerator, I have a poodle, I know poodles, poodles are friends of mine. Wreckerator, that's no poodle. Actually I like the hedgehog on antidepressants....he's kind of cute. The blowfish is now my profile picture. I think it's adorable. Also, the hedgehog totally looks like a spiny pig-in-a-blanket. What did the wreckorators LOOK at before making the cakes??? One of these blowfish is poison. I would have been very confused without the comments on this one. Awesome as usual, and today's bonus is that I almost laughed my lunch right onto my computer screen. And by "almost" I mean "definitely." wv: dingersw. Dingersw the cute blowfish/B.O.B. cake, or was it just me? But at least the purported blowfish cake appears to be chocolate. So there's that. Almost any difficulty of appearance can be overcome with chocolate (except brown piles of poo icing). wv = piedeco. I'm not sure but might be some variation of cajun music. So funny! Do you think the decorator had a pun in mind? If so, we'd almost have to take it off the wreck list (hey, I said ALMOST). I never did like the mutated Q-tips people call poodles. Maybe if people didn't 'style' their hair that way? The blowfish is cute, and I love almonds. I was thinking a Snork, but Q'Bert definitely puts in an appearance! The Blowfish on Antidepressants is too cute. 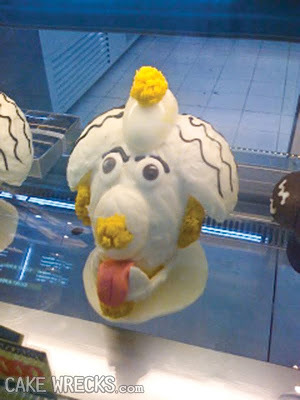 I wonder though, who wants deviled eggs with their poodle-cake. Is that really egg yolk for decoration? I love the chinchilla cake, so adorable. I first thought that the Happy Puffer was skewered with french fries till I read the comments that suggested they were almonds - that made better sense. At least until I went back and looked at the scale; either those strawberries next to it are minuscule or those mutant almonds. I think french fries, myself! wv: waysorta - Those cakes are waysorta outa sight, man! Am I the only one who thinks the first cake looks like it has cut up bath sponges stuck to it? I LOVE the blow fish on antidepressants! It's super cute and if I needed to buy a silly cake or just wanted cake. WV; Unpar - most of these cakes were unpar. That first wreck is not a poodle. A lamb wearing gold earrings? Maybe. If you squint. But a poodle? No way. I actually like the blowfish on anti-depressants. I'm thinking he's gonna be real tasty too. 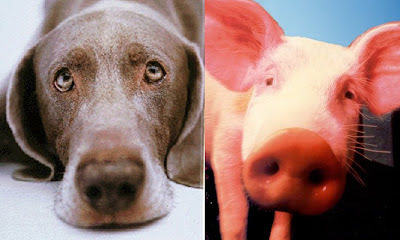 I don't think it's a pig next to the dog, I think it's meant to be an echidna. Or a very spiky pig. You need to start selling t-shirts with the "complicated" hedgehog on them. The "awwwwwwCUTE" factor of that picture, with that caption, will put any diabetic in a coma for a week. 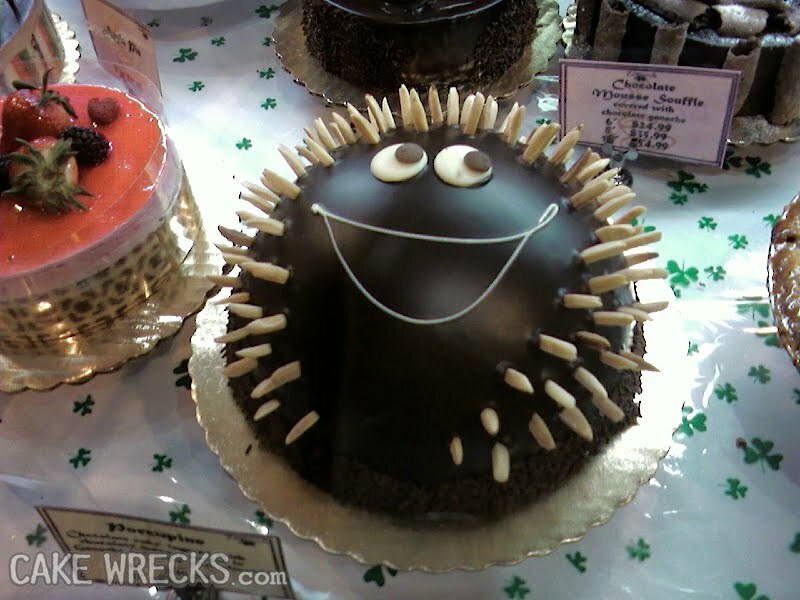 The "hedgehog" cake? Not so much, really. The cake should be poking about an abstract animation sequence, randomly shouting, "DIMSDALE!". yay for cute animal pictures AND funny cakes! I've just gotta say- these cakes are funny, but not half as funny as the funny stuff you write about them. I thought the blowfish looked more like a hedgehog. Why oh why would anyone buy these? Unless there is a super tasty cake under neath all that frosting..no lol. 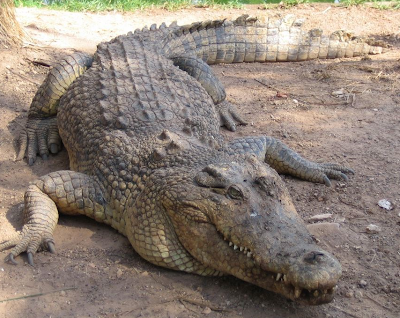 And anyone brings that CCC blah alligator to my house had best have an escape plan. Awww. The blowfish made my morning. 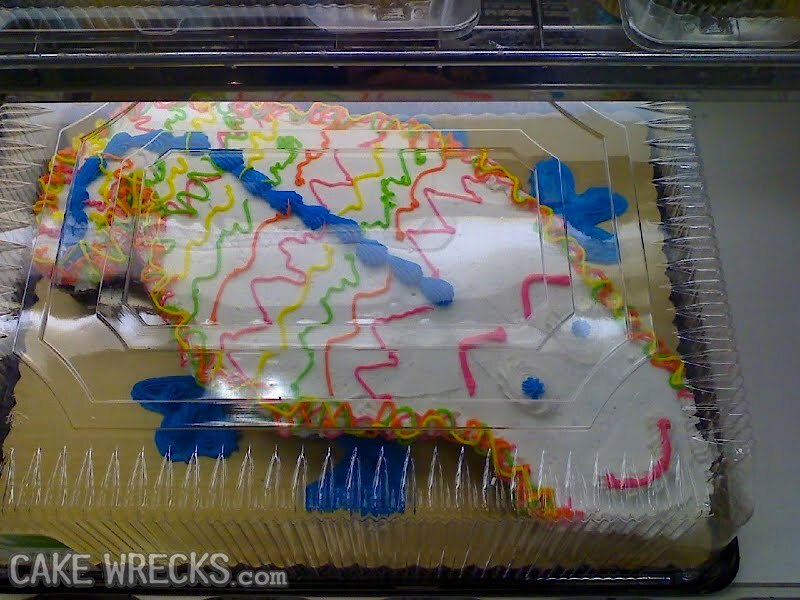 The sign next to the blowfish cake says that it should actually look more like a porcupine. Which is a huge miss. Also for those wondering what the spikes are, they are white chocolate shards. You can find a recipe for how to make it online. Which I think I might be this weekend. 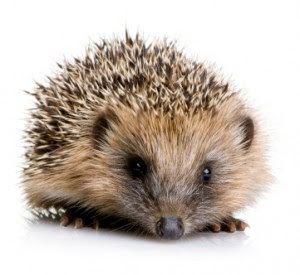 Actually, in Macbeth, when one of the witches refers to a hedgehog, she calls it a "hedge-pig." Maybe the wreckerator is a closet Shakespeare fanatic? I agree with @Anonymous 2/18 6:06 -- #1 is a lamb wearing gold earrings, some sort of gold thing on its nose and a wrecky attempt at a sombrero. We all wonder who buys these -- the real question in the case of this particular cake: why is there more than one? yikes...to all of these wrecks! 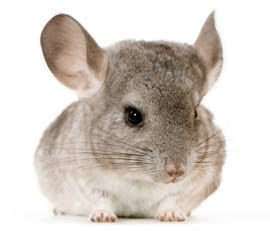 The real chinchilla is SO adorable!!! The cake version...not so much. Looks more like a cantaloupe someone iced with light blue icing and then decorated as a clown. Why? wv: "soryagon" And all of the cake wreckers in the world say, "Soryagon for making such horrible wrecks!" The great thing about that not-chinchilla cake is that there's actually a picture of a bunny cake on the sign..and the two cakes don't look alike at all. It's as if the wreckerator wants you to notice how much of a wreck it is! Other commenters have proved that my identification (Feb 18 10:23am)of the porcupine/pufferfish's spines as almonds is mistaken. I now submit a correction: they're cookies. Now where can I buy that cake? PS: wv is "grabemu". Let's not go there, please. Craig's "Dinsdale" comment for the win! Monty Python (still) rules! oh wha gah uh MWAHAHAHAHAHAHAHAHA something is SOOOOOO here!!!!!!!! I can't figure out what the Korean Chincilla cake is supposed to be but it is cookies and cream flavored. I LOVE ANIMAL CAKES!! pretty sure that little blue thing with all the whipped cream is a fake ice cream sundae? Hedgehog people (those of us who are owned by one) also call our babies hedgepigs... but yeah... no. Ok. 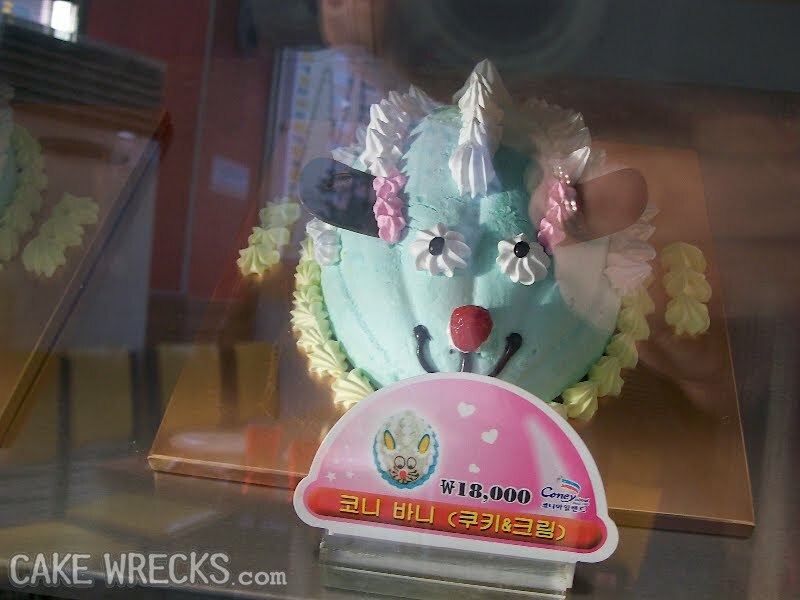 I would seriously have that blowfish cake for my own. Ridiculous and cute! I really liked the 'blowfish on antidepressants' crack. The thing is, i seriously needed some before my sister showed me this site. And, TADAA! My depression evaporated. Thanks to you. Seriously Thanks. le gourmet in manhattan sells a porcupine cake that looks just like the blowfish cake. XDXDXDXDXDXDXDXDXD i would very much like to snuggle him. <---- made my life.